Imagine watching a game of football where both managers are making decisions on what substitutions to make and when, based on live data taken from players showing what their fatigue levels are like. At the same time, satellite systems and tracking cameras fitted throughout the stadium stream real-time information to the dugout about what tactics the opposing team are using and what formation might best counter the opponent’s system of play. It sounds like a utopian scenario for football managers, and their small but growing departments of sports data analytics professionals. Suddenly the coaches no longer have to rely on gut instinct alone – they can have their thoughts substantiated by cold hard data that minimises the risk of their decision making. While it might sound a bit sci-fi it could soon become a reality thanks to the rapid evolution and adoption of wearable technology developed specifically for professional sports. Wearable tech is already a massive global industry thanks to the "quantified self" movement – the push for "self-knowledge through self-tracking". This trend has spawned a raft of consumer targeted gadgets like Fitbit and Nike Fuelband, with sales of these devices soaring year on year. According to Canalys, in the first quarter of 2014 2.7 million smartbands were sold and by 2017 this figure is anticipated to top the 45 million mark, with the total wearable tech market enjoying sales of 111.9 million units worldwide by 2018 [Source: IDC]. But where will be the biggest impact of wearable tech in professional sports and what are the main hurdles that stand in the way of widespread adoption? 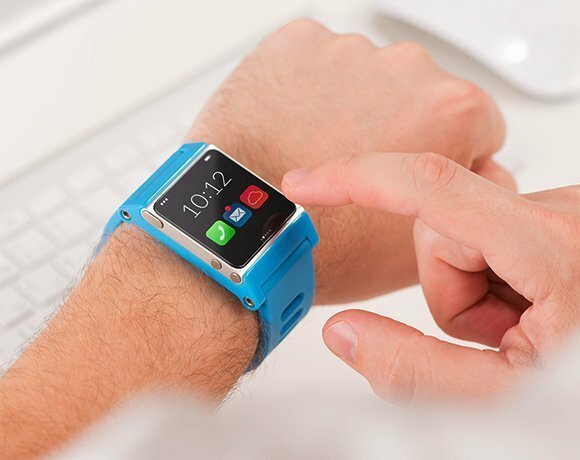 Although wearable tech is still in its infancy – especially when it comes to devices aimed at professional sports – it’s already spawned a healthy cottage industry of startup technology companies that have developed wearable devices that address all manner of different problems. This is in addition to the global sports equipment giants who are starting to develop kit fitted with sensors that offer an insight into player performance – for instance, Adidas recently launched a range of different monitoring equipment, including a Smart Run smartband and a Smart Ball fitted with sensors for dead-ball training, under its miCoach brand. However, the companies that are really leading the charge in this field are not household names. They are companies like Australia-based Catapult Sports. It provides two systems to professional sports teams, such as Aston Villa, Bayer Leverkusen and AC Milan: OptimEye S5, which uses satellite reception (both GPS and Glonass), and ClearSky, which is a local positioning system (or indoor GPS). Both technologies involve players wearing a vest fitted with a small device at the top of the back to capture data, says Boden Westover, marketing manager at Catapult. “The data is gathered either in real-time, where the athletes are on the field and the staff on the sidelines capture the data and then do their analysis; or post session, where the data is stored on the device’s internal hard drive and you upload everything to your computer after the training or game,” says Boden. Once the data has been collected users can take advantage of Catapult’s suite of algorithms, which have been developed to accommodate a number of different sports, to measure what’s just occurred. He cites the example of two of the company’s most successful algorithms to underline this fact – a bowling algorithm for cricket that can accurately measure the speed of a ball based on a bowler’s run up and release and a goalkeeping algorithm that can monitor “goalkeeper specific movements” like dives and jumps. Of course with any data gathered by technology like this, the key is making sure that you use the output correctly. This is where sports data distribution companies like Stats come to the fore. In addition to forging partnerships with wearable tech equipment developers like Catapult, to combine their data output with the company’s existing extensive catalogue of data, Stats has also developed its own product called SportVU – a camera-based player tracking technology that is currently used in the NBA and various different football leagues around the world. The system offers a number of benefits, according to Brian Kopp, senior vice president of sports solutions at Stats. “Our game data is used by front-office executives in many ways to evaluate players, including development, acquisition, valuation, etc,” says Kopp. “This past season was the first year where we had our SportVU cameras in every arena so we are only working on one year of full data coverage. A further area where wearable tech has a potentially vital role to play in professional sports is in injury prevention. There’s been a lot of coverage in the media about concussion injuries in sports like rugby and American football. To this end, in conjunction with wearable tech company mc10, Reebok recently developed Checklight – a piece of headgear that fits under the helmet of NFL players and flashes red or yellow to alert coaches to the fact that a significant impact has occurred. On a similar theme Force Impact Technologies has launched FITguard – a mouthguard that contains motion sensors that can detect serious impacts and trigger an illuminated strip on the front of the guard to indicate whether the impact was at a safe level. While wearable tech devices like this have obvious advantages, there’s currently a major stumbling block standing in the way of widespread adoption. Although wearable tech devices can be used in countries like Australia, FIFA doesn’t allow their use in competitive football games nor does the NFL or the NBA. But Kopp, for one, believes that it’s only a matter of time before this attitude changes. For many coaches, managers and sports data analytics professionals this eventuality can’t come soon enough, says Catapult’s Westover. “Coaching is an art, but it doesn’t hurt to back up what you do with science,” he says. “The technology is new enough and the coaches that use it are smart enough to use it extensively without becoming too reliant on it to the point where they’re not making their own decisions," he adds. I don't really agree on this, the wearable tech gadgets aren't mature enough to rely on; I'd rather appreciate the use of technology for decision making. Like we've a 3rd umpire in cricket overcoming the wrong decisions, perhaps bringing an identical scenario to other sports are equally good for grooming them. Wearable technology has been involved in some sports for a long time. Beyond the obvious heart rate monitors in training, fencers wear metallic lamès and use wired weapons to take the guesswork out of scoring as alish1alda is suggesting be added to Cricket. I agree with some of the examples in the article that the technologies which will spread fastest are those that enhance strategy and promote safety. Monitoring the vitals of players to determine when swap them out with those on the bench, as suggested by the opening paragraph seems like just one more reason for individuals to use steroids or otherwise game the system. It will be interesting to see if the monitoring can become sensitive and analytical enough to actually help make decisions based on performance or potential danger. One place I think this could be tremendously helpful is in Summer training for football. It would be nice to not have to hear about players dying due to heat stroke or other completely preventable actions. Sensors in helmets to register impact and help ward off continued hammering leading to concussions would also be a huge plus (yes, they take the chances when they play the game, but I think it's both good sports and good business sense to monitor your players and make sure they can remain as healthy as possible). The biggest problem with these systems is not technological. Note that the NFL already has helmet sensors that could help track concussion-level injuries, and they are choosing not to use them (with the support of the players' union) due to concerns by players that they'll be used to write off a player as "damaged goods." I think the place for the data gathered from sports wearables will be most valuable in the abstract and in the lab. Until there is a way to up the immediacy of the feedback AND train athletes how to modify their actions right away, this tech is still going to require analysis and then findings will need time to be implemented. Gathering more statistics doesn't necessarily mean we will put all those numbers to use. Or have trainers and coaches properly schooled in interpreting that data. We will presumably - the industry is still nascent - but for the moment, analytics is mostly limited to well-monied professional teams. Or worse, those numbers could be used incorrectly, either unintentionally through lack of understanding, or intentionally through misplaced competitive spirit.